Click the link to view the Peter Anderson Festival Gallery. 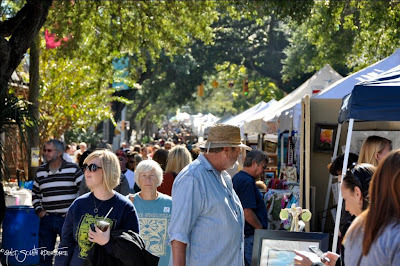 In November on the Mississippi Gulf Coast the weather is still sunshine and warm, and in true coastal fashion we are still having as many events as we can. Well the Peter Anderson Festival in Ocean Springs is one of the last big events there is, and well worth it. It is ranked as one of the Southeast Tourism Society's top 20 events of the year, and it is all focused on the art. You can walk through over 350 vendors and find everything from vintage art to modern masterpieces. Just like how a small southern town should be, you can walk and socialize, look at art and socialize, listen to live music at Marshall Park and socialize, or just... socialize. This gives all of the talented artists in and around the area to get out and show off their stuff. I wanted to throw this plug in here since I referenced the festival in my last post. Make plans to come out next year, but go ahead and pencil out the whole day, you will need it. For more information on the even go to http://www.oceanspringschamber.com/paf/. Click the picture above to view more pictures from the 2010 event.